Back in October I just had to have Nailtini Stinger, a teal duo chrome shade. I'd never ordered from them before, but I thought if I was going to pay shipping, I might as well pick out another shade. Bourbon Satin was my choice, and both Stinger and Bourbon Satin are from a 4 piece set by Janie Bryant, the costume designer for Mad Men. Also included in my package was a mini in On the Rocks, so that was a pleasant surprise! Below: Bourbon Satin is described as a satiny sable shimmer, and it has some nice features going for it that go beyond that description. 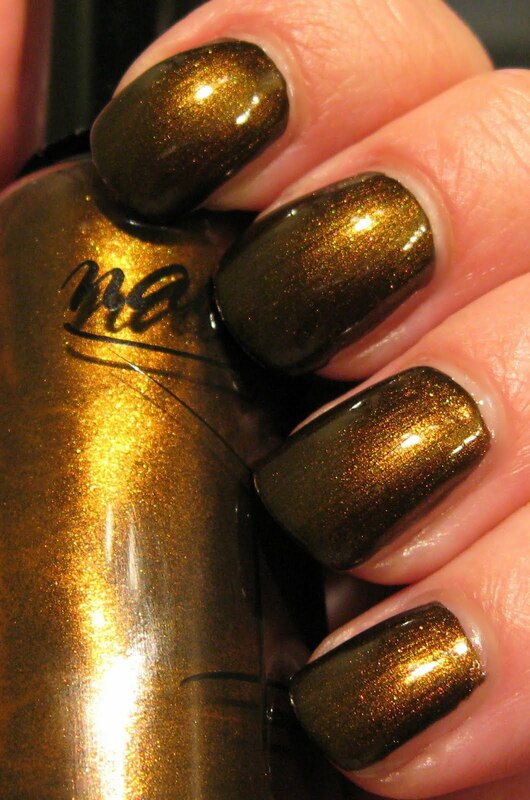 This shade has a blackened base, making it a one-coater, always a plus in my book. It also has the slightest hint of olive that while not a duo chrome like Stinger, it does exhibit some color change in various lighting and with movement. Above and Below: The top photo was taken without a flash, showing its warm golden glow. The blackened base provides a frame around the edge of the nail, and there's also green, gold and pale red micro shimmer added to the mix as seen in the macro photo below. I'm fond of earthy shades, of which Bourbon Satin is a very pretty and fancy interpretation of. Below: On the Rocks is sparkly and pretty, but with a clear base I personally think it's a little too weak to use alone. It's not meant to use alone, as it's listed as a top coat. This is described on the web site as a chunky silver glitter, but it's very delicate glitter and not chunky at all! I used 2 coats here to give you an idea of what it looks like. 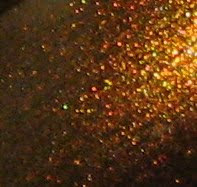 This silver glitter with very small glitter pieces applied/dispersed evenly. Below: On the Rocks works well as a top coat over other shades, shown here over Bourbon Satin. Again, the laziness in me won out and I simply put it over what I had on already, but I think it would look nice over a dark blue or purple. It could also be used as a gradient top coat during the holidays to give an illusion of snow. 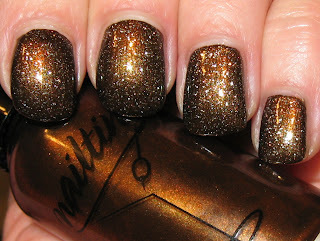 Nailtini polishes are available on their website, as well as from QVC. The full sized bottles (.5 fl. oz.) are priced at $14.00 each, and the mini polishes (.25 fl. oz.) --which don't seem like mini polishes--they measure 3" high and have a full-sized brush/stem for an easy application--retail for $6.00 each. They also have some interesting looking special effect top coats that I just might have to check out here. I've only tried three of their polishes, but they've all had a very nice formula with high pigmentation. A little pricey at $14.00, but I'm completely satisfied with the mini bottle design, so I think that might be the way to go for me. I've been wanting Bourbon Satin since it came out but I've been waiting until my school schedule allowed for a job again, this didn't help my need! hahah. on the rocks is cute! LOVE the swatches! Thanks for sharing. I'm helplessly in love with the pictures of Stinger I've seen, but I'm loving this Bourbon Satin a lot more than I expected to love an amber brown! :) Very pretty! Bourbon Satin is fantastic looking. I'll add that to my list of "wants". Love that olive look to the polish. I don't own any of this brand. The special effect top coat I'll skip. I have plenty of top coats like that. what a gorgeous polish the first !!! You find always great polish !!! Combo is fantastic, i love effect !! PRETTY! 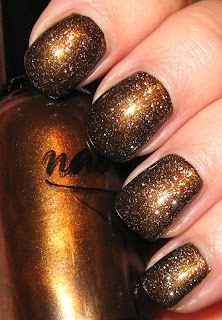 I just saw nailtini at Beauty360 for the first time, but they did not have this colour or I would have snapped it up!! On the Rocks looks great over Bourbon Satin. I've been eyeing BS, but I can't really bring myself to spend $14 on a bottle of polish right now.